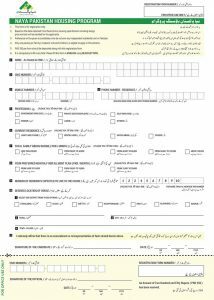 Prime Minister Imran khan’s “Naya Pakistan Housing programme” registration form has been issued on Wednesday by NADRA. The Housing Task Force consist of eight members from private sector, five from federal government including secretaries housing, law and justice, finance, planning, NADRA chairman and five provincial housing ministers, or their nominees. “Our target is to build five million affordable houses in five years. Only ordinary people will benefit from this scheme,” said prime minister. “Inshahallah, we will steer Pakistan out of crises. It’s a difficult time for us but this too will phase soon,” he said. Prime Minister Imran khan will personally inaugurate the project. , Swat, Islamabad and Faisalabad. with the formatives in the form. Prime minister also promised that with the opening of this large project he will deliver 10 million jobs to the jobless people. With the construction of each house it will create 20 jobs per year which means 12 million jobs a year. The jobs will be given on the basis of unskilled, semi-skilled and skilled, plus the industry skilled will given 15 million jobs related to industry and service industry. It is expected that with the above measures the costs of the houses would 15% to 20% lower than the market price of the area, Houses are also provided by the long term loans because PM says that “We are trying to increase the number of people who want to afford houses with 100% in the first three years”. All allowed land titles will be verified by the authority. The land will be attain by the authority. The authority will decide that what and how many products are needed for the project with the help of builders and developers and the authority will get the product after studying the market. The authority will also make sure that the necessary infrastructures like water, roads, electricity and sewerage etc. To increase the financial resources of the banks the following sources of funds will be considered, pension funds, zakat funds, provident funds, funds at the disposal of insurance companies, EOBI, Social Security institutions etc.